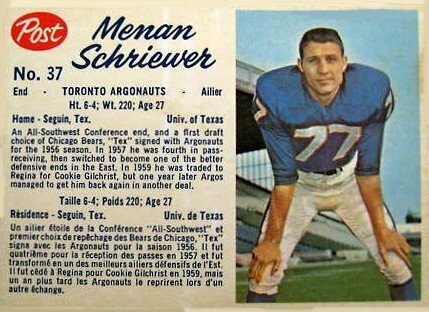 Menan Schriewer played college football at the University of Texas and was a first round draft pick of the Chicogo Bears of the NFL in 1956. 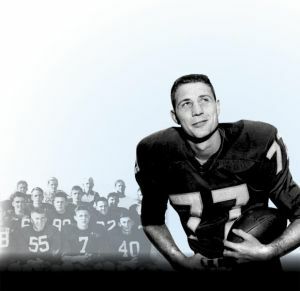 Schriewer came to the CFL in 1956 and stayed for seven seasons (1956-62), all but one with the Toronto Argonauts. The one non-Toronto year was in 1959 when Schriewer went West to play for the Saskatchewan Roughriders. Schriewer played both offensive and defensive end, and played in the CFL at the time most teams were transitioning to separate offensive and defensive units. This meant that two-way players like Schriewer ended up being slotted in either on offense or defense, depending on the situation and only used on the other squad when injuries struck. With Schriewer, he ended up playing mainly defensive end at the end of this career. This is reflected in his receiving stats where Schriewer had 24 catches in his rookie season, 43 in his second season in 1957, and then a total of 41 in the five seasons combined after that where he played mainly on defense. Those 43 catches in 1957 were good enough for fourth in the East, and earned Schriewer an East All-Star at offensive end (there were no CFL All-Stars until 1962). Schriewer is a 2009 inductee in the University of Texas Hall of Fame. Menan Schriewer passed away on December 30, 2013.